What does celebrating the Eucharist mean to me? QUESTION: Can you share your thoughts regarding the importance of “celebrating” the Eucharist. What does it mean to you? What is its spiritual significance? Is everyone invited to participate? I am finding the celebration of the Eucharist as an evolving process. I’m still working out my personal meaning on the finer points, and in that sense it is an internal (and esoteric) experiment. My hope is that the process evolves me spiritually. I do feel a sense of Presence when performing the ritual, so I feel certain that something very real is happening. I really do think it involves a process of working with, and interacting with, Divine energy. Now I don’t objectively think that God needs little ol’ me to bring God into the world. I think much more likely is that we are ourselves benefited by lending in a hand; by the very process of helping out. It is not so much for God’s benefit, in other words, than for our own benefit. We gain something spiritual in the “doing” of the ritual. Most of us learn best by doing. And celebrating the Eucharist helps to better refine our connection to the Holy Spirit, both our sense of this connection, and transformationally on the spiritual-emotional level of our being. I like to think performing this ritual is refining my spiritual self – my “energy” self or my “soul” or “spirit” – however one wishes to frame that concept. This is very much related to the transubstantiation of the bread and wine. In my view, while these do not literally become meat and blood here on earth, in the spiritual realm their nature *is* changed. (The physical transubstantiation of the bread and wine a metaphor for this higher, spiritual Truth.) So it is the spiritual counterpart to the bread and wine is what is being transmuted, transformed, transubstantiated. So too, with us. There is a lot to be said for the power of our beliefs. As we we think, so we are. Taking-in the physical counterpart of the bread and wine into our bodies, most likely activates us on several levels of our being. On one level this helps make this experience real to our bodies. It becomes tangible. Emotionally and spiritually we become more open and more receptive. Most likely, this helps our transference of spiritual energy in the spiritual realm, and from the spiritual realm into the physical realm. And if nothing else, I find it is a reminder to myself to be more Christ-like. And I can use all those reminders I can get! What actually happens during the Eucharist liturgy? I generally ascribe to the Liberal Catholic Church’s view that in celebrating the Eucharist -the Holy Communion of bread and wine- I am helping to open up a little window into the world, encouraging the entry of Divine energy to flow into this world. This spiritual energy – which one might name the Presence of God, or the Holy Spirit – flows into the altar, the chalice and host, into the priest, outward into those present, and continues to spread outward into the world at large. Unseen, there are present angelic beings who strive to facilitate this two-way flow, exchange, or transference, of spiritual energy. We offer our oblations of loving worship to God, and God offers us common-union with the Holy Spirit, and Divine Love. The bread and wine are especially charged with this spiritual energy/Divine Presence/Love/Holy Spirit. Those who take this into themselves gain additional benefit by closer contact with these spiritually charged elements. This is why healing services are performed following the Eucharist portion of the liturgy, after those present are most fully “charged” with the spiritual energy of the Holy Spirit. In contrast, baptisms precede the Eucharist celebration – but ideally are part of a Mass (due to the higher state of spiritual energy) – because the process of becoming baptized prepares one’s spiritual body for more efficient, effective transmission of this spiritual energy. What of those present in the ekklesia (the congregation)? Each person chooses their level of involvement with the ritual. The spiritual energy/Presence flows into those *both* participating and merely present. However, I feel that when attending Holy Communion one best benefits oneself – and all others – by mentally, emotionally, and spiritually engaging in the ritual. Those “simply present” may increase their participation in the exchange of spiritual energy by placing their awareness – attention, intention, and perception – on what is taking place during the liturgy. 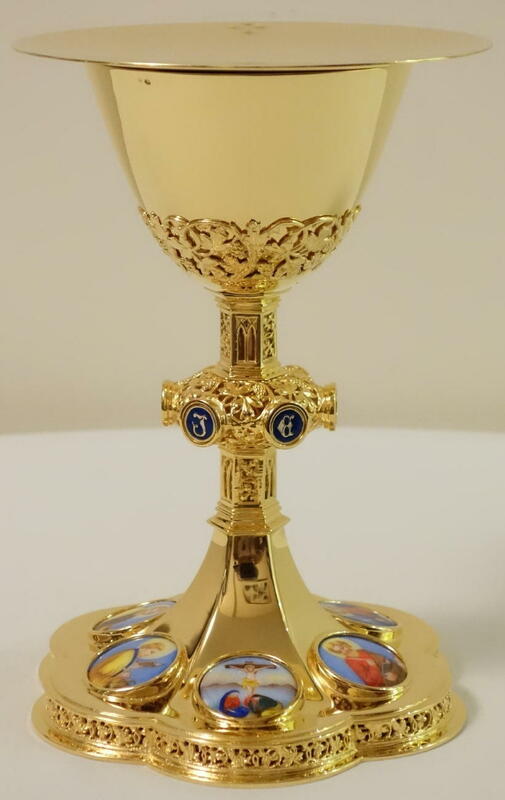 As a person better understands what the service is trying to convey, and how the channels are opened between the physical and spiritual realms, each person is able to lend their spiritual heart to this process, encouraging this Divine energy to enter into the alter, the chalice (wine) and host (bread), the priest, to those present – including themselves – and then outward into the world at large. Specifically how an individual “lends their heart” to the service will vary according to their psychology. One might find visualizing the flow of energy useful, another may hear the singing of attending angels, another may feel rumbling or other sensations, and another may feel the upwelling of emotion and love increasing until it overflows and spills forth into all those present, and outward into the world. Or any combination of the above. Or perhaps through some other modality. How one specifically encourages the process, and specifically in what manner one personally engages in the experience, is far less important than one *does* participate and engage in the celebration of the Eucharist. Ideally experiencing physical, emotional, and spiritual participation. Alternately, one may just sit there and eat a cracker after an hour or so passes. But I suspect that would be of minimal benefit – yet still of benefit – to that individual. The Eucharist liturgy is a form of theurgy. A kinda scary word! Citing Wikipedia: “Theurgy (from Greek θεουργία) describes the practice of rituals, sometimes seen as magical in nature, performed with the intention of invoking the action or evoking the presence of one or more gods, especially with the goal of uniting with the divine, achieving henosis, and perfecting oneself”. Ritualized religious-spiritual magic, in other words. And so it is. This view is perhaps colored by my attending seminary, but I do not see “magic” as automatically associated with evil. Liturgy is a structured behavior, giving structure to a worship service. In other words it is a set of ritualized actions and behaviors meant to convey specific meanings and evoke specific reactions within us, and certainly in the case of the Mass, offers oblation to God with the hope, intent of procuring favor at some level. That is engaging in the process of ritualized religious magic: theurgy. On the other hand, magic is merely what we name a technology we do not comprehend. That may very well be the case here. We certainly do not really understand all the inner workings of the spiritual realm. In the meantime, we just do our best. Is spiritual refinement taking place? I do see celebrating the Eucharist liturgy as one means of helping to refine one’s in-dwelling Divine Spirit. The whole point is to make, feel, develop, and extend our connection with The Christ. Another view which I hope may be taking place, is that the ritual may begin to open my spiritual eye to better perceive the Divine Center. So in this sense it is an effort to develop my personal aptitude for mysticism. For feeling a connection to the Divine. And as I say, I do feel some connection. I find this experience is very real. I can feel it. And I do believe this is a form of spiritual refinement. Building and maintaining the spiritual edifice of the Eucharist. Then there is the idea of thought-energy-forms. Many people have poured sincere intention into this form of ritual for nearly 2,000 years. That in and of itself builds up spiritual energy. By reproducing the ritual we too connect with that, feed from it, and feed back into it for others in the future. In a very rough way, one might think of this as a type of spiritual battery. I suspect this too is taking place. Seen through this lens we are reaching far back into the ancient roots of our spiritual tradition, deriving real benefit from their service, and we are simultaneously passing forward this continuing spiritual tradition – and effective energy – for future generations. Is everyone invited to participate in the Eucharist celebration? In contrast, the Roman Catholic Church officially only permits Roman Catholics (in good standing) to participate in the Eucharist. That said, how strictly this is enforced varies. I recall attending several Roman Catholic Masses in high school, and I took the Eucharist each time. It really seemed like the whole point, and even then I appreciated that aspect of their liturgy. However, I still knew I was really not supposed to be there and that really weakened the experience for me. Each denomination will have their own rules and individual parish observances on this point. I’m sure there is a great deal of variation, both inter- and intra-denominationally. I suspect one of the reasons my denomination invites any sincerely seeking person to take part in the Eucharist, is we view this as one of the most powerful, spiritually charged rituals one may celebrate. If we are in fact correct in our assumption that performing the Eucharist celebration opens a positive, beneficial channel between this world and the spiritual realm, isn’t that one of the very best places for a person seeking God to experience a meaningful connection, a “common-union” (Holy Communion) with the Divine? Where better to find affinity with God? Where better to kindle one’s Divine Spark? Why deny someone seeking God’s Presence such an opportunity? So for all these reasons I celebrate the Eucharist.